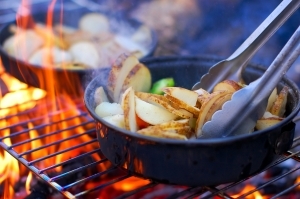 If you like the outdoors, then you’ll love these tasty camping recipes. Cooking and eating outdoors is very enjoyable, especially when you are in the company of good friends and family. All of these recipes are quick and easy enough to make. Mix all of the ingredients and transfer to strong aluminium foil, or a grill pot. Grill container over campfire for about 30-45 minutes. Cut chicken into cubes and place inside a Ziploc bag. Pour in marinade and soak for at least two hours. Cut all the vegetables into cubes. Once the coals of the fire are ready, put kabobs together on skewers and grill until vegetables and chicken are tender. Season chicken breasts with seasoning spice, salt, pepper, cilantro, and hot sauce. Grill or sear chicken on grill pan until fully cooked. Sauté pepper and onion. Arrange them on top of the chicken breasts and sprinkle the two cheeses on them. Add bacon strips on top. Cover with aluminium foil and bake on grill until cheese has melted. Wash potatoes and wrap them in foil, adding a little oil to keep it from sticking. Cook over hot coals. Brown the beef in a grill skillet and season with taco seasoning. Add a little water and cook until done. 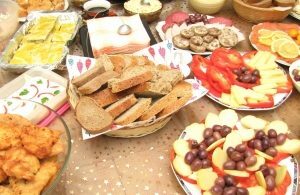 When the potatoes are ready, arrange salad on a plate and top with the potatoes and cheese. Use butter, salsa, hot sauce, salt and pepper to flavour your dish. Top with taco meat and other fixings for tacos. Soak corn in their husks, making sure they are completely covered with water. Place soaked corn directly over hot coals and cook for 15 minutes, and turn corn over to make sure that each side is roasted enough. Add butter and salt to taste. Prepare this at home before camping. Slice uncooked chicken into stripes, drizzle with olive oil, and place in Ziploc bags. Add garlic, liquid smoke, and spices. Remove seeds and core from peppers, and cut into strips. Do the same for the onions and place those in another container. At the campground, grill chicken on the grate. On a grill skillet, melt butter and add the vegetables. Cook until well done, and then arrange chicken, vegetables, and toppings on a tortilla. No matter if you are the camping grill master or a newbie at cooking while camping, these recipes should prove to be easy enough for anyone to follow. Try one of the recipes above, and you’ll be on your way to becoming a camping recipe guru. Sarah writes on behalf of Campers In Cornwall who can help you with Volkswagen camper van hire. If your looking for VW camper van hire check Campers In Cornwall for great deals. Camping can be fun, and it can be a chore. Trying to keep meats cold if all you have is an ice chest and nowhere around to replenish the ice. Plus dealing with a bunch of soggy bread and meats got to be too much. I gave up and did some research and found some long term food storage companies that don’t add chemicals and the food is good for 25 years. I liked it so much we started buying and selling it on a regular basis, for disaster preparedness and easier camping.